I've been reading the Gossip Girl books and watching the show for years. The one thing the show has that the books didn't are the amazing outfits! Blair, Serena, Chuck, Nate and all the other characters are dressed to the nines in every episode. 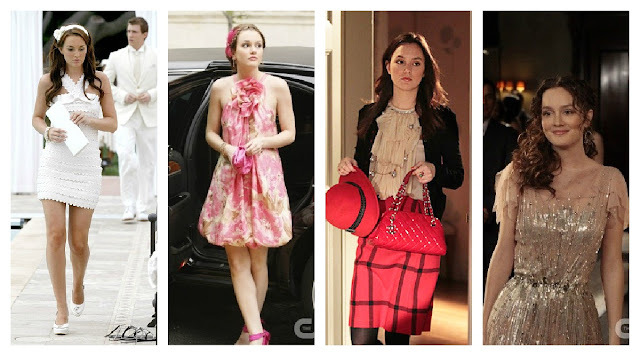 Since this is the final season of Gossip Girl, I thought I'd dedicate this post to my favorite looks from the show over the years. Click here for all the looks from season's past and my Pinterest board dedicated to GG style. What is your favorite fashion moment from Gossip Girl? Gorgeous Gossip Girls! Excellent work, Lauren! This may be my favorite blog post ever!! I love GG and you picked all my favorite outfits!! i love chair!! have you ever seen whatchuckwore.tumblr.com? it's hysterical. OMG thank you for that website! It's hilarious! i know!! its quite pathetic and predictable, I guess you could say I'm watching for the clothes! I can't believe I've never watched this show! The styling is amazing!! This is a great post! I loooved when Blair wore that white Marc Jacbos dress! And Serena in the gray lace?! STUNNING!! !